Enthusiastically covered by the international press, the canal boosted Egypt’s profile and placed it at the vanguard of the new. 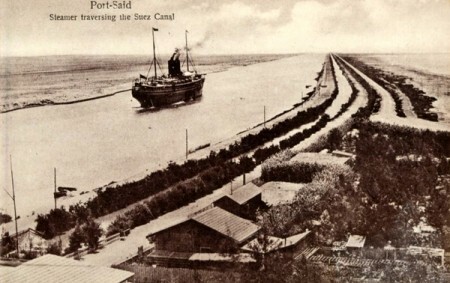 The canal shortened the route between Britain and India by 9,700km and, along with America’s cross-country railway, inspired Jules Verne’s Around the World in 80 Days (1873), whose travelling hero heralded the modern age of speed and daring. The canal also inspired the Statue of Liberty, originally envisaged by the French sculptor Auguste Bartholdi as a gigantic Egyptian fellaha (farm woman) holding a torch with a beacon light pouring from her forehead. Bartholdi called the monolith “Progress”, and proposed that she be placed at the canal’s entrance. But Ismail’s budget was stretched too thin too afford more progress: he settled on two wooden obelisks and an electric lighthouse instead, and Bartholdi eventually repackaged Egypt’s progress as America’s liberty.